There was something unexpected at this year’s Farm Progress Show in Decatur, Ill.: libraries. 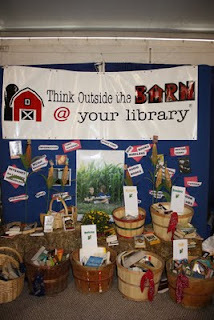 The Decatur-based Rolling Prairie Library System designed its Farm Progress Show booth with the theme “Think outside the barn @ your library” to promote the value of librarians, libraries and their services to the residents of agricultural communities. Catching people’s eye is the key. The Farm Progress Show is the nation’s largest agricultural show, with an annual attendance of 300,000 people from 20 states and 10 countries. For the Rolling Prairie staff and its volunteers, it’s the perfect time to talk about the importance of rural and small libraries. This is a fun usage of the "@ your library" brand that really fits its target audience. And it's working! You can read the full press release here and see a video interview about it here. There are more pics here. And, as someone who grew up in a farming community, I can tell you two things for sure: 1) Rural libraries need to promote their value to farmers, who often don't see a need to have or to fund them, and 2) This would get their attention!